It could be said that the true driving force behind the creation of the Club International des Anciens Pilotes de Grand Prix F1 (The Prix Drivers Club) was Swiss grand prix driver Emmanuel de Graffenried whose racing career spanned thirty years as a successful private entrant. 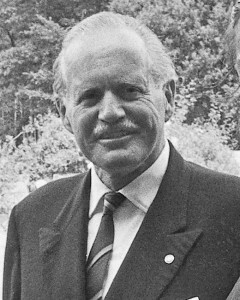 Baron Emmanuel Leo Ludwig “Toulo” de Graffenried, though born in Paris, was a Swiss from wealthy artistocratic parents who returned to Switzerland. He was privately educated at the Institut le Rosey where he made many friends in high society but always had an interest in cars. In 1936 at the age of 22 he entered for the Mille Miglia in a 6C 1750 Alfa Romeo. 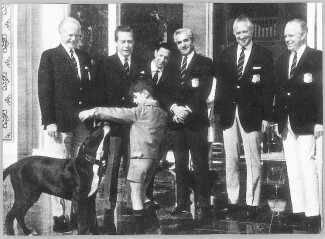 However, it was his meeting and friendship with another school friend, American John du Puy, whose family were in the steel business, that set him off on his grand prix career. Together they bought two Maseratis, a 6CM for John du Puy and a 4CM for de Graffenried, formed their own team and travelled around Europe in 1937 and 1938 racing everywhere. They came to England and raced on the Isle of Man and at Donington Park. Though his early 1100cc Maserati was not the most successful – he had taken advice and modified the front suspension to the Tecnauto design as used by Raymond Mays in his ERA but it did not work with the Maserati. By 1939 he was now racing a 6CM Maserati running as Ecurie Autosport. At the end of World War II de Graffenried was keen to get back into racing and being loyal to Maserati he joined forces with Philippe Verkade and Ciro Basadonna , all three of them with the more modern 4CL Maseratis. Again they raced under the Ecurie Autosport name. During this time “Toulo” became friendly with Italian engineer and driver Enrico Plate. When Maserati introduced the new 4CLT model in 1947 run by Scuderia Ambrosiana both saw the future and when the uprated 4CLT/48 was introduced the following year Scuderia Maserati gave “Tuolo” his first drive in a factory 4CLT/48 car in the Italian Grand prix held on the Valentino Park circuit in Turin. 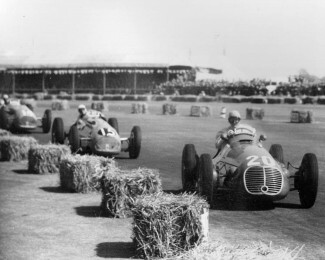 Though he competed in the first British Grand Prix at Silverstone in 1948 with his old 4CL De Graffenried was to return to Silverstone in 1949 this time with his own private 4CLT/48 and was able to defeat the strong Scuderia Ambrosiana team of similar cars to win his first major Grand Prix. 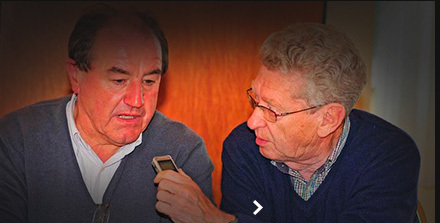 By now de Graffenried had forged his links with Enrico Plate and drove alongside Prince Biri in the first ever World Championship Formula 1 grand prix at Silverstone. Sadly for him he broke a con-rod and was out of the race. Throughout the 1950s the elegant, charming and amusing “Toulo” continued to race in both Championship and non Championship races in Maseratis. 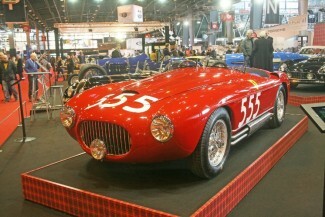 Firstly with the A6GCM which morphed into the iconic 250F. 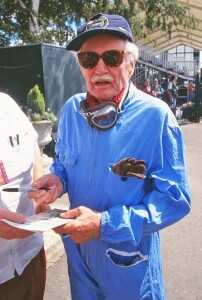 Away from the circuits he was approached by American film director Henry Hathaway to help out with a proposed film titled “The Racers” and to star a young Kirk Douglas. Hathaway needed cars which were given mock names and the idea was to actually film grand prix races and the Mille Miglia with these cars. Thanks to his links with Maserati “Toulo” was able to obtain two Maserati A6GCMs and have them converted into “Burano’s” but had a problem when it came to getting a sports car for the Mille Miglia scenes. He approached Enzo Ferrari to buy a couple of cars on behalf of the studio but when Ferrari heard they were going to be rebadged as Burano’s he said no. Along with his friend American driver John Fitch “Toulo” was able to buy three cars, a 166mm, a Coupe and a 212 Export from private owners and they were sent to Autodromo the Modenese coachbuilders to make superficial changes to the car.This latter car, the Ferrari 212 Export turned up earlier this year (2015) at Retromobile still with its flat outside exhaust, Maserati-style nose and the Burano badge on the nose. De Graffenried was actually entered for the Mille Miglia in 1955 and ran for a short distance with a camera car but was not an official entrant. Meanwhile ~Toulo” had developed a successful Alfa Romeo dealership in Switzerland and became friendly with John Hogan the Promotions Manager for Marlboro cigarettes. It could be said that one of the results of that friendship was not only the development of Marlboro as a motor racing sponsor but also as the original company to sponsor this Club. 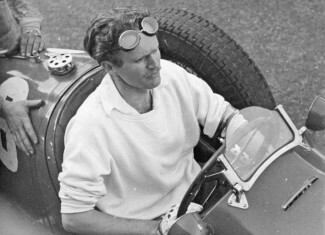 The season 1955 was his last as a competitor and his final two events were in Maserati 300S again owned by his friend John du Puy. 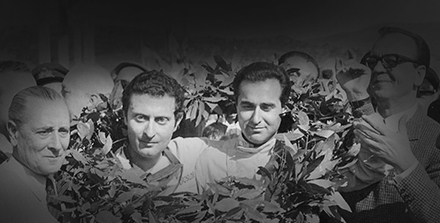 In Portugal, his second last race proved that though he was not a multiple grand prix winner he was a fast and skilful driver as he hounded Masten Gregory’s Ferrari’s 750 Monza to finish second in the race at the age of 51. De Graffenried signs autographs at a historic event which gave him the change to get back into racing overalls. “Toulo” continued to be an active member of the club until his death in Lausanne in 2007 at the age of 92 even donning blue overalls to drive in demonstrations when well into his ‘eighties. 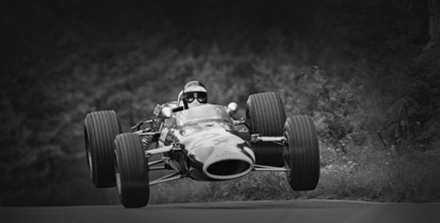 He epitomised a lost age of motor racing; an age of courtesy, grit and bonhomie.